Scooby-Doo! & Batman: The Brave and the Bold (film, 2018). A 2018 American animated direct-to-video superhero action comedy film by Warner Bros. Home Entertainment/Warner Home Video. Directed by Jake Castorena. Official Trailer. Scooby-Doo! & Batman: The Brave and the Bold is a 2018 American animated direct-to-video superhero action comedy film directed by Jake Castorena. Scooby-Doo! & Batman The Brave and the Bold Trailer. Batman drives a ghost which the gang is chasing away, and warns the gang to keep away from this case for their own safety. When the Puppeteer attacks again, Fred overpowers Perpetto and his hench-puppet, and the gang unmasks them as Martian Manhunter and Detective Chimp. 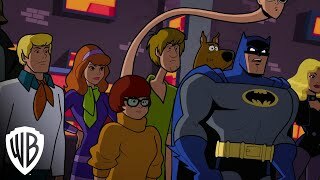 As Batman and his associates reveal afterwards, the Puppeteer scam was actually an initiation test for Mystery Inc. to join the ranks of Mystery Analysts of Gotham. Mystery Inc. arrives at the Analysts' headquarters, where they additionally meet Question, Black Canary and Plastic Man, as well as Aquaman. Mystery Inc. is asked to take the lead in the next case for the Analysts. When an alarm sounds from Gotham Chemical Storage, the assembled Mystery Analysts head for the warehouse, where they find that several phials with a radioactive isotope have been stolen. A red-cloaked figure from the old theater appears before them, calling himself Crimson Cloak and swearing revenge on Batman and Gotham for making him into a ghost. Crimson Cloak sets the storage on fire, but the Analysts escape the blast with Plastic Man's help. 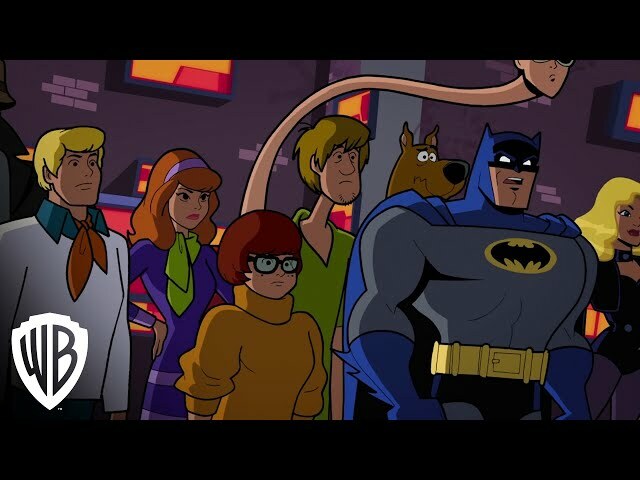 While the superheroes put out the fire, Batman sends Mystery Inc. to a diner to rejoin them later. Following the gang's questions, he reveals the tale about his single unsolved case. Many years ago, at the start of his crime-fighting career, Batman attempted to stop Professor Milo from completing an experiment with faulty teleport technology. However, the vortex created by the device killed one of Milo's assistants, Leo Scarlett, a failure that has haunted Batman since that time. They conclude that the likely suspects behind the Crimson Cloak would be either Sam Scarlett, Leo's father, or Riddler. The film Scooby-Doo! & Batman: The Brave and the Bold was scheduled to be released by Warner Bros. Home Entertainment and Warner Home Video on January 6, 2018 (TCL Chinese Theatre) and on January 9, 2018 (DVD and digital).